Are you interested in learning key practices to sustain your creative life? 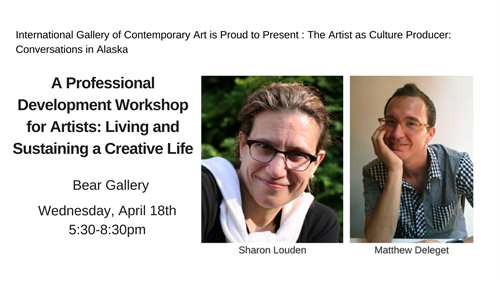 International Gallery of Contemporary Art is pleased to present a FREE professional development workshop with Artist, Advocate for Artists and Editor of the "Living and Sustaining a Creative Life" series Sharon Louden with Artist, Curator and Arts Worker Matthew Deleget. Sharon and Matthew will share information that applies to artists of all disciplines and also allow time for discussion. The International Gallery of Contemporary Art has received funds from the National Endowment for the Arts Art Works, the Ford Foundation, Emily Hall Tremaine Foundation, Rasmuson Foundation, and the Alaska State Council on the Arts. The project is facilitated by ICGA’s partners in Alaska including the Anchorage Museum, Alaska Design Forum, University of Alaska Anchorage, University of Alaska Fairbanks Museum of the North, Fairbanks Arts Association, Juneau Arts and Humanities Council, Ketchikan Area Arts and Humanities Council, University of Alaska Southeast, Ketchikan Public Library, and Parnassus Books.